In October of 2010, the American Civil Liberties Union published a report titled In for a Penny: The Rise of America’s New Debtors’ Prisons. The ACLU had found that debtors’ prisons were “flourishing” in this country, “more than two decades after the Supreme Court prohibited imprisoning those who are too poor to pay their legal debts.” In 2011, Huffington Post reported that debtors’ prisons were legal in more than one-third of the states in this country. Two years ago, the Wall Street Journal reported—after interviewing twenty judges across the country—that the number of borrowers who were threatened with arrest in their courtrooms had “surged since the financial crisis began.” The Wall Street Journal added that some borrowers who were jailed had “no idea before being locked up that they were sued to collect an outstanding debt” because of “sloppy, incomplete or even false documentation.” Diamond said it was becoming more and more common for debtors to serve time in jail. She added that some debtors are even required to pay for their time spent in jail—which, she said, exacerbates their dire financial situations. She [Robin Sanders] was driving home when an officer pulled her over for having a loud muffler. But instead of sending her off with a warning, the officer arrested Sanders, and she was taken right to jail. Sanders owed $730 on a medical bill. She says she didn’t even know a collection agency had filed a lawsuit against her. “They say they send out these court notices, and nobody gets them,” Sanders says. She spent four days in jail waiting for her father to raise $500 for her bail. That money was then turned over to the collection agency. • Despite clear constitutional and legislative prohibitions, debtors’ prison practices are alive and well throughout Ohio. An investigation by the ACLU of Ohio uncovered conclusive evidence of these practices in 7 of the 11 Ohio counties examined. • Courts in Huron, Cuyahoga, and Erie counties are among the worst offenders. 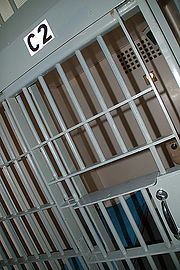 In the second half of 2012, over 20% of all bookings in the Huron County Jail were related to failure to pay fines. In Cuyahoga County, the Parma Municipal Court jailed at least 45 people for failure to pay fines and costs between July 15 and August 31, 2012. During the same period in Erie County, the Sandusky Municipal Court jailed at least 75 people for similar charges. • Based on the ACLU of Ohio’s investigation, there is no evidence that any of these people were given hearings to determine whether or not they were financially able to pay their fines, as required by the law.